When the Nidahas Trophy 2018 kick-started on March 6, there were reports that the Nidahas trophy final of the tournament was already sold out, and that India and Sri Lanka were expected to lock horns in it. India managed to live up to the expected standards, and form one half of the title clash, but an emotionally-charged Bangladesh defied conventional wisdom and usurped the hosts to take the other spot. Upbeat after a thrilling victory in their last league game against hosts Sri Lanka, Bangladesh will have their tails up as they prepare to take on Rohit Sharma-led Team India in the final of the Nidahas Trophy T20 tri-series at the R Premadasa Stadium on Sunday. While the second-string Indian team recorded a hat trick of comfortable wins after their opening loss to Sri Lanka, Through two fascinating wins over Sri Lanka, Bangladesh have upped their T20 game like never before and now stand on the brink of turning a new chapter in this format for themselves. But they cannot let the events and emotions of their final spot-sealing win over Sri Lanka to repeat itself. Surely not against an opponent they have never beaten in this format. However, an angry Shakib Al Hasan’s attempt to call the team off the ground and allegedly damaging of the dressing room by Bangladeshi players is a testimony that they still have some way to go as far as composure is concerned. Going into Sunday’s final, India with a second-string team minus regular captain Virat Kohli and veteran Mahendra Singh Dhoni, will hope their skipper Rohit will lead from the front and replicate his form in their previous encounter against the same opposition on Wednesday. 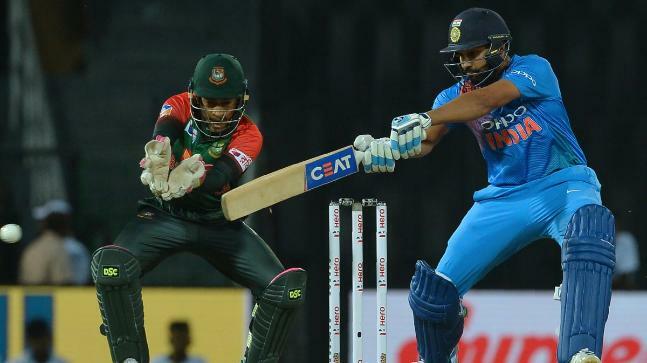 Rohit struck a brilliant 61-ball 89, his 13th T20 half century and was well supported by veteran left-hander Suresh Raina (47) as India edged past the Bangladeshis by 17 runs to seal their spot in the final. Rohit’s opening partner Shikhar Dhawan has also been amongst the runs during the tournament even as the men-in-blue would hope for some fireworks from the likes of Lokesh Rahul and the middle order comprising Dinesh Karthik and Manish Pandey. Among the bowlers, teenaged off-spinner Washington Sundar has been the find of the tournament with his exploits in the powerplay overs, while leg-spinner Yuzvendra Chahal has supported him well. If India are to restrict the Bangladeshis, the rookie pace department, comprising Mohammed Siraj, Shardul Thakur and all-rounder Vijay Shankar will need to complement the spin duo. On the other hand, bolstered by the return of regular skipper Shakib Al Hasan, Bangladesh will definitely go all out in the summit clash. Their top order comprising Tamim Iqbal, Mushfiqur Rahim, Soumya Sarkar and Mahmudullah have been amongst the runs while Liton Das seems the only weak link at the top. The Bangladeshis will also be wary of Washington Sundar, who ripped through the top order in the previous tie. Bangladesh’s bowling department led by Mustafizur Rahman and Rubel Hossain have troubled the Indians more often than not and will aim to replicate that in the final. Left-spinner Shakib’s inclusion has only added more spice to the contest. The Bangladesh Cricket Board (BCB) expressed their regret over the team’s behaviour during a Nidahas Trophy match against Sri Lanka on Friday night. The Twenty20 International at the R. Premadasa stadium in Colombo descended into chaos following an umpiring decision and the BCB said that it has warned it’s players and stressed to them the importance of upholding the spirit of the game. Bangladesh did go on to beat Sri Lanka by two wickets and will face India in the final of the tri-nation T20I series on Sunday. “The Board accepts that conduct of the Bangladesh Team in certain instances was unacceptable on a cricket field,” the Bangladesh Cricket Board (BCB) said in a statement. “The Bangladesh Team members have been reminded of their responsibility in upholding the spirit of cricket at all times,” it added. Drama unfolded when Mustafizur Rahman missed two bouncers from Isuru Udana in the final over and was run out, but the Bangladesh players contested the call, saying it was a no ball due to its height. Skipper Shakib Al Hasan looked furious on the boundary and even waved to call the batsmen back to the pavilion. 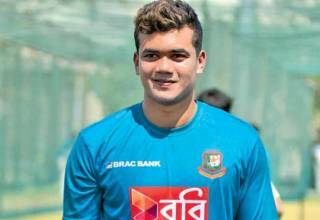 Reserve player Nurul Hasan, who was sent to the field with a message from the Bangladesh dressing room, was also involved in a spat with Sri Lankan skipper Thisara Perera. The International Cricket Council on Saturday fined both Shakib and Nurul 25 percent of their match incomes and handed them one demerit point each for their part in the fracas. During the Bangladesh players’ celebrations, Sri Lankan batsman Kusal Mendis was seen yelling at them as the Tigers’ Tamim Iqbal tried to calm him down. A glass door was shattered by someone from the Bangladeshi dressing room immediately after the game, sparking further criticism. Bangladesh will face India in the final of the three-nation tournament on Sunday. So how’s your heartbeat now? Mine was racing at the speed of a F1 car. Having written all that needs to be written, there’s one final thing to do before wrapping up. As Harsha Bhogle so rightly tweeted, tonight’s innings should be the second coming of DK. No. 4, 5, 6 or whichever spot in ODIs and T20Is should be stamped and sealed for the foreseeable future. He deserves it for the amount of talent he has. As far as Bangladesh are concerned – they can hold their heads high and try again. Shakib’s hope may and hopefully for their sake should be realised someday. But that’s for later. We are done for now. On that note it has been Srivathsa who has single-handedly – like DK – brought the action from here for everyone out there. I’m off to rest and recuperate from all the madness witnessed at the Premadasa. Do remember to read up everything that has been served up here and will be from Shirshendu and others. Until next time, it’s goodbye from me. Be well and stay safe!